The blocking of a protein produced by normal stromal cells in the tumor microenvironment can hold back pancreatic cancer growth and metastasis in mice—and could represent a promising target for human drug development, researchers in the U.S. and Taiwan have concluded in a study. “It looks like this protein might be a druggable target, so we're hoping that with some additional follow-up work, it's something that we'll see go into patients,” Ellen Puré, Ph.D., chair of the department of biomedical sciences at the University of Pennsylvania School of Veterinary Medicine, who led the research. The Penn-Vet team and collaborators in Taiwan report their findings in “Fibroblast Activation Protein Augments Progression and Metastasis of Pancreatic Ductal Adenocarcinoma,” published in Journal of Clinical Investigation Insight. Research reported by Dr. Puré’s team last year showed that inhibiting a stromal protein-cleaving enzyme, known as fibroblast activation protein (FAP), held back tumor growth in mouse models of lung and colon cancer. 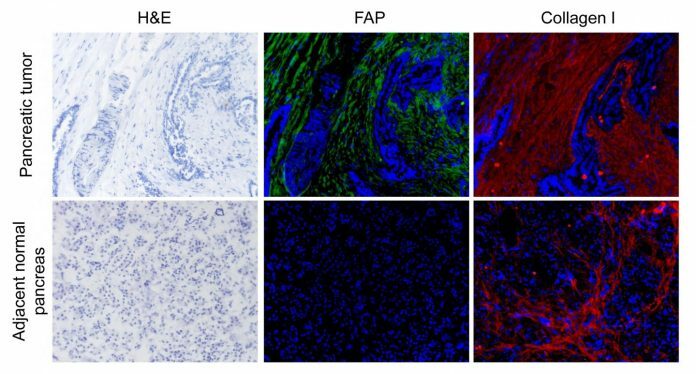 FAP acts to chop a key extracellular matrix component collagen into degradable fragments, and this FAP-dependent turnover of collagen effectively impacts on tumor growth. The mouse lung and colon cancer research indicated that inhibiting FAP led to an accumulation of extracellular matrix material, which blocked tumor growth because the undigested collagen prevented the tumor from receiving an adequate blood supply. In their latest studies Dr. Puré’s team investigated whether FAP could impact the growth of pancreatic tumors, cancer metastasis, and potentially pancreatic cancer survival. In humans, pancreatic cancer has a median survival time of just 6 months, and a five-year survival rate of less than 5%. The Penn-Vet-led team first looked at stromal FAP expression levels in 121 human clinical pancreatic tumor samples. They found that overexpression of FAP by stromal cells was predictive of poor overall and disease-free survival. “Univariate regression and multiple regression analyses of overall survival and disease-free survival indicated that FAP expression level was a significant, independent predictor of survival for patients with PDA [pancreatic ductal adenocarcinoma],” the authors wrote. Moreover, while knocking out FAP didn’t affect tumor structure, FAP deficiency did result in increased necrotic tumor cell death, and this was associated with increased infiltration by lymphocytic cells, which indicates that FAP may normally act to block the immune system from controlling tumors. “FAP expression may contribute to the resistance of PDAs to immune-mediated control of tumor progression,” they suggest. Further studies indicated that FAP enhances tumor metastasis and may drive tumor spread to other tissues. “Collectively, these data indicate that FAP protease expressed by stromal and/or tumor cells may play critical roles in the progression and metastasis of pancreatic cancer,” the authors concluded. The researchers added that they aim to further investigate how FAP promotes disease progression, and if its protein-cleaving role is found to be responsible, evaluate whether existing inhibitors might represent a starting point for human pancreatic cancer drug development.